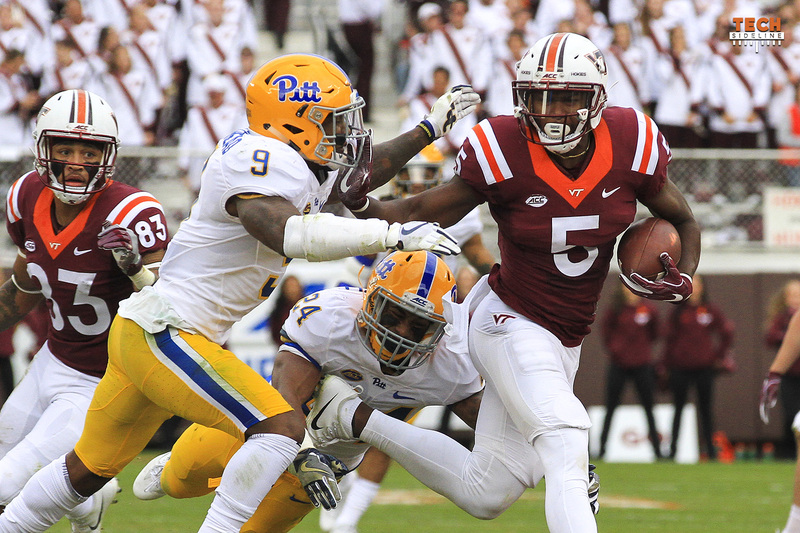 Virginia Tech (4-4, 3-2 ACC) will look to rebound from consecutive losses to Georgia Tech and Boston College when they face the Pitt Panthers (5-4, 4-1) on the road on Saturday. Both of these teams come into Saturday’s game in different form. After a tough start, Pitt has won three of their last four games, with their only loss coming in a narrow defeat at Notre Dame. Meanwhile, the Hokies have lost three of their last four, and they probably would have lost four games in a row were it not for a UNC fumble on the one-yard line. Still, we saw some life from Virginia Tech last weekend against Boston College, and Pitt’s entire schedule indicates that they are very beatable. 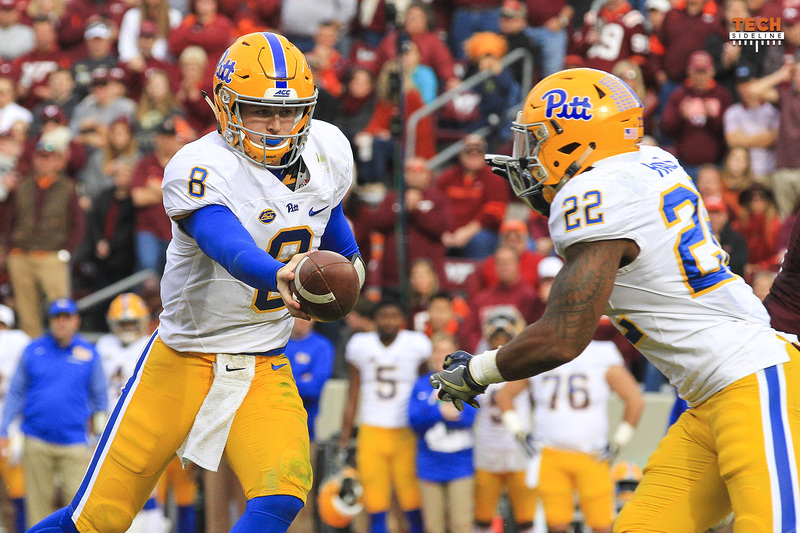 At 4-1 in the ACC, Pitt can take a huge step forward toward winning the Coastal Division with a win over the Hokies. They already have the tiebreaker over Virginia, and a win over the Hokies plus one win in their final two games against Wake Forest and Miami would lock things up for the Panthers. This will be a huge game for them, so you can expect their effort level to be extremely high. Let’s take a closer look at the Panthers. If Boston College is Dr. Evil, then Pitt is Mini-Me. Both teams have a lot in common, not only with their experience level, but with how they play the game, and their strengths and weaknesses. The big difference, however, is that Pitt isn’t quite as good as Boston College. They do a lot of the same things, but not quite as well. Pitt has big, physical runners such as Qadree Ollison (6-2, 225, rSr.) and Darrin Hall (5-11, 225, Sr.) in the backfield, but they aren’t quite as big or as good as BC’s AJ Dillon. Like BC, the weakness of the offense is at quarterback, where Kenny Pickett (6-2, 220, So.) is the starter. However, he’s not as good as BC’s Anthony Brown. Pitt’s defense is also big and experienced, like BC’s, but they only rank No. 87 in the defensive S&P+ rankings, while the Eagles rank No. 28. There are a lot of similarities between the two teams, in terms of experience and style of play. It’s like playing the same team two weeks in a row. Except Pitt just isn’t quite as good as the Eagles. Most of the statistics bear that out. If you’re a Tech fan, that’s encouraging, because the Hokies played BC tough last week and had a good chance to win the game if not for some critical errors, especially late in the first half. Tech will be facing that same team again this week, only it’s not quite as good. The game will also not be played in Lane Stadium, where the Hokies are 1-3 this season. I don’t know whether that’s a good thing or not, but perhaps the Hokies could use a change of scenery for a weekend. I do know that the Hokies are 2-0 in their last two road games, and 0-3 in their last three home games. Sure, Heinz Field has been Tech’s House of Horrors since 2001, but I don’t think that really matters in this one. The biggest difference between BC and Pitt is the fact that the Panthers run a lot more misdirection than the Eagles. In that way, the Panthers more closely resemble Georgia Tech, as Brandon Patterson covered this morning in his article. They’ll make Virginia Tech’s linebackers and safeties a little less confident when reading their run keys. Above I described them as a mini-Boston College, but in some ways they could be described as a mini-Georgia Tech as well. Their similarities to the Yellow Jackets scare me a lot more than their similarities to BC, needless to say. Let’s take a closer look at the Panthers, including that dominant running game. Ollison and Hall form a very good and very physical duo in the running game. Both guys are big, and they are both productive. Neither of those guys is physically as good as AJ Dillon of BC, but their style is similar, and it’s very possible that both could be drafted in May. Ollison ran for 122 yards on just 19 carries against the Hokies in Lane Stadium in 2015. However, Hall and the Pitt running game struggled against Tech last season. As a team, the Panthers ran for only 55 yards and averaged 1.8 yards per carry. Hall had 15 carries for a total of four yards. However, that was an experienced Tech defense, for the most part. That was a defense that featured six starters who are currently on active NFL rosters (though Terrell Edmunds didn’t play that day), plus Mook Reynolds and Trevon Hill. This season’s game is a much different matchup. Like BC, the Panthers also have a veteran offensive line. That’s four redshirt seniors up front for the Panthers. Overall, I believe this line is a little better than BC’s offensive line, though they are also helped by the fact that the coaching staff runs more misdirection. V’Lique Carter (5-9, 170, Fr. ): 9 carries, 142 yards, 15.8 ypc, 2 TDs. Carter has played in just two games this year, but those two games are Pitt’s last two games. He torched Duke with seven carries for 137 yards and two touchdowns. However, he had just two carries against UVA, and he’s dinged up a bit. We don’t know whether or not he’ll play against the Hokies. Pitt could still elect to redshirt him. Pitt has two receivers who carry the ball from time to time. Watch for Pitt to use plenty of other options in the running game besides the traditional tailbacks. They don’t want the Hokies parking on the inside running game as they did last week against Boston College. They’ll attempt to confuse Tech’s young defense much more than Boston College did a week ago. The Panthers can’t do much of anything in those situations, and their offensive line breaks down in pass protection. 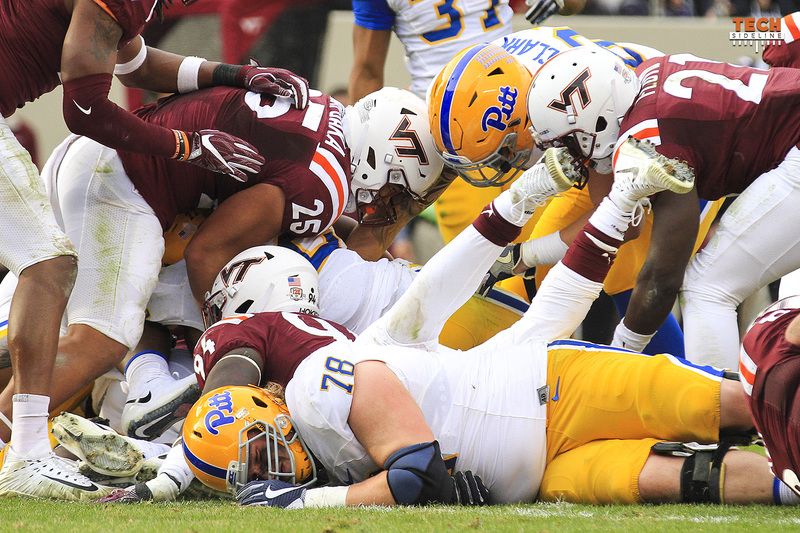 It’s imperative that the Hokies keep Pitt in as many long-yardage situations as possible. Pitt has been a disappointment defensively this season, considering their experience level. The Panthers start six seniors on the defensive side of the ball, and they are all redshirt seniors. They also start three juniors. You’d think that with that many veteran players on the field that Pitt would have had more consistent defensive performances. However, things have been anything but consistent. Pitt’s defensive performances have varied from week to week. After getting torched by Penn State, they shut down Georgia Tech’s spread option. Then the next week, they got handled by UNC. After two more bad performances against UCF and Syracuse, they held Notre Dame to 19 on the road. Then a struggling Duke offense dropped 45 on them. And finally, last week against UVA, they shut down the Hoos in Charlottesville. It doesn’t get any more up and down than that. Overall, Pitt has been better against the run than the pass, though they can hardly be considered good at stopping either. The Panthers even struggle to stop opposing offenses even when they know they are going to throw the football. In short, the Pitt defense isn’t good. It’s fair and accurate to say that they’ve been good at times, but they’ve played poorly more times than they’ve played well. I felt pretty good about this game until I read Brandon Patterson’s article this morning and read about how much misdirection Pitt throws at teams. I’d like Tech’s chances more if the Panthers ran their offense like Boston College. After last week’s defensive performance, I think the Hokies could handle that. But misdirection will hurt the ability of Tech’s young linebackers to make their key reads quickly, and a split second hesitation is the difference between shutting down a play and allowing a big gain. On the other hand, I still feel okay about this game simply because of the law of averages. Most ACC games seem like coin flips or crapshoots this year. 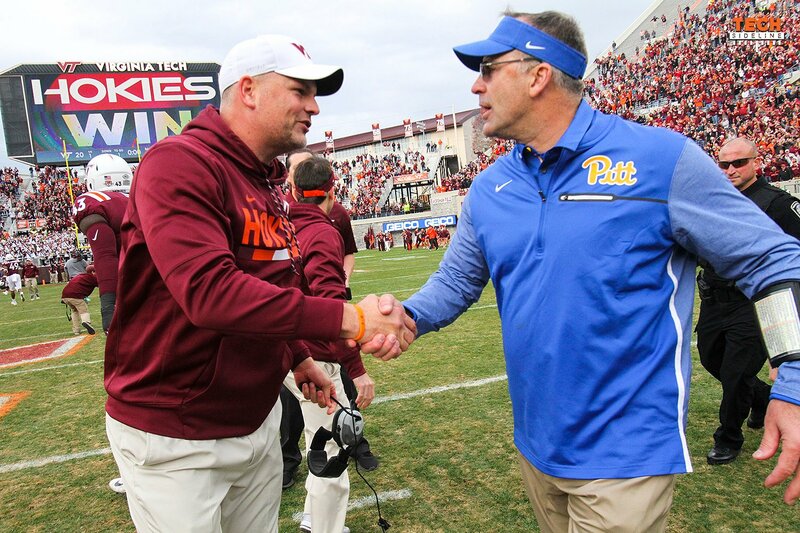 The Hokies have lost three of their last four games, and Pitt has won three of their last four. It’s probably about time the Hokies won a coin toss or rolled a seven again. Likewise, maybe it’s time for Pitt to crap out. Another thing that makes me feel better about this game is that Pitt loves to play press coverage. The Hokies burned that press coverage two years ago when they had receivers who could go up in the air and beat cornerbacks for the football. If there’s anything the Tech offense does this year, it’s win those one-on-one battles on the outside. Guys like Damon Hazelton, Eric Kumah and Tre Turner have been very good at that, and Ryan Willis throws an excellent ball that gives his receivers a chance. If I were Pitt, I’d probably mix things up more this week, but we’ll just have to wait and see whether or not they deviate from their usual scheme, and if so, how much. Earlier today on the TSL Podcast (which was recorded on Wednesday afternoon), I picked the Hokies 27-24. Then I read Brandon Patterson’s article about Pitt’s misdirection, and I got a lot more worried than I previously had been, as someone who hasn’t watched the Panthers play this year. I’m not a big fan of changing my pick from the Podcast to the preview, but I do have to ask myself a question: is that misdirection that Brandon told us about this morning worth at least another four Pitt points? Will Stewart’s Take: I’m going to be bullheaded here and pick the Hokies. For reasons I can’t explain, I feel good about this game. Is the matchup bad, from an experience level? Yep. Could Pitt’s power/misdirection running game give Tech’s defense fits? Yep. Could the Hokie offense fail yet again to score 30+ points? Yep. The single most worrisome part of this matchup to me is Pitt’s older players against Virginia Tech’s young players, and the fact that the Panthers don’t play many young players. Researching Pitt: Pitt has 19 seniors on their roster, and all but one of them (RB Darrin Hall) redshirted. The Panthers list 30 true freshmen on their roster, and as far as I can tell, only one of them (WR Shocky Jacques-Louis) plays regularly. That's impressive roster-building. For that reason alone, given the closeness of this rivalry, picking Pitt is the thing to do. But I’m not gonna. Logic, reason, and matchups aside, I just can’t see this Pittsburgh team moving to 5-1 in the ACC, or this Virginia Tech team losing its fourth game of the last five, including its last three. How are the Hokies going to get it done? I’m not really sure. This is a leap of blind faith, one that doesn’t make a whole lot of sense. I see pitt winning by 21 points, with the o-line they have they will blow our d-line off the ball like ga tech did unfortunately. I do not think our offense can score to keep up with pitt either. Hopefully things start to come together today. Better late than never, andwe ARE runnig out of time FAST!…GO HOKIES!!!! Great analysis, Chris, as always. Thinking with the cold and windy game conditions, our best chance to win is to start Quincy Patterson so we have a much better chance of establishing the run game, controlling the clock, and keeping our defense off the field. We know Quincy Patterson only has two games left to play and still protect his redshirt. But thinking Ryan Willis will hopefully be able to beat Miami and UVA, and then we can use both Quincy Patterson and Ryan Willis when we play Clemson for the ACC Championship. If Pitt’s misdirection is “worth at least another four Pitt points,” why did you give them 7 more instead??? Heart = Hokies. Head = Pitt. Afraid that I see that being the pattern for the rest of the year. Hokies All, When Brandon Patterson says, “Pitt is a combination of GT & BC” that is enough for me. Pitt wins by more than the spread and revenges last year’s VT goal line stand “W”. Sorry to say, but looks like two streaks end this year. But hopefully I’m way wrong. GO HOKIES!!! Hopefully a few VT coaches’ careers also end this year ! This very talented but young team is bound to sprout out of the ground at any minute. I think this is the game that they do, we are facing a situation where we get put out of contention for the ACC and quite possibly a bowl game. Hazelton and Dax are both going to make major plays on their sides of the ball and come out of a gritty and tough to watch VT 21-17 win as budding leaders! Is there any team that’s been more consistently inconsistent since joining the league than Pitt? I know the track record playing at Heinz going back to the last few years of the Big East isn’t pretty, but Fu is 1-0 there and I guess I just have the same sort of nonsensical gut feeling Will does. Maybe Willis goes off, hitting sideline jump balls for a 400 yard day, maybe the light goes on for Bud’s D and they shut down the misdirection and force 3-4 turnovers, or maybe the Panthers just lay an egg. But I’m feeling this one: Hokies 34-24. Neither Chris nor Will seem uncertain about their picks. That’s how I’ve felt in every game except Billy & Mary and ODU (and look what happen in Norfolk). FSU (at the time) and Duke were pleasant surprises. ODU was a nightmare. I penciled in Notre Dame as a loss even though I thought in the back of my head that the Irish might under perform that night. I didn’t expect us to beat Georgia Tech (another nightmare) or BC but had blind faith that we would somehow pull out a win. I felt the same way about the UNC game, but we pulled out a win even though we were outplayed. Pitt has always been a tough venue for Tech but Fuente is 2-0 vs. the Panthers. I think this game will be like the UNC and BC games and I have no clue how we’ll come out at the end. I “HOPE” it ends up as a road win like the UNC game. That should be certain not uncertain. I have to share that I love to see your predictions (yours and Wil) , however i do not like what i read some times, especially you write up today changing based on some’s article. Chris I have noticed this year you keep putting gas on the fire regarding the poor performance (won -loss) by Tech by repeating the what if issues such as what you wrote today ……” they probably would have lost four games in a row were it not for a UNC fumble on the one-yard line. Still”, …… you point out the half empty issue on glass half full …….every sporting event is based on the total out come…………..it is what happen’s on the field of play and all plays count………….. for example you could have said in one of the games, if the wide receiver had caught the ball, versus letting it go through their hands, the other team would not have scored a TD ! which would have changed the whole game. thanks for our write ups……………. Go Hokies. we are due to have one game where we play 4 quarters !! of great football and if we do we will win. . …. I have been to Pittsburgh to VT games so many times. Love That place for the Food and Downtown places. But I’m glad I will miss this one. I rode home back thru West Virginia wondering Why & How VT lost. I believe I will not have to wonder this Saturday… Pitt will Take care of Business , sad to say, The Usual will keep VT Down. Do I need to say…. There is no way that VT beats Pitt this weekend. As much as I want it to happen the team just doesn’t have the talent, or more importantly the experience to get the job done. This season is over. If there was ever a “must win game” this one is it! on their field!! Go Hokies!! If there was every a “must win game” this one is it! Crank out 40 big ones with everyone on O in sync. Let’s get up by 2 TDs and make it a chase game. The WR and TE are there to put up some points; and put down the panthers. Come on D get 3 good quarters and the O with 4 good ones and the team can handle the chase. GO HOKIES tame da putty tats!!! On paper Pitt should win easily. But nothing—literally nothing, perhaps outside of the Notre Dame and GT games—has gone exactly according to script this year. VT had no business beating FSU or Duke, and certainly had no business losing to ODU. You don’t know which Pitt team will show up from week to week. Same w VT. Pitt has been good at home (except for the PSU game), but as CC said, it’s getting about time for Tech to get lucky again. Will it happen this week? Or will this team lose to Pitt, make us sweat against Miami before ultimately pulling it out, and then make us REALLY sweat after Thanksgiving w a bowl bid and UVA streak on the line? to be fair, you cant just take out QB sack yardage…its part of the game. lets just hope our DL can get some of those sacks! At the beginning of the season I look at Pitt on the schedule and I think “AARRRGGH!” Especially when the game is there. And that’s before the coaches have picked a starting lineup. But you guys look at our current slump, weighed against Pitt’s recent success, and decide we have a fighting chance. I don’t know what they put in your Koolaid but I’ll take a sip because I’m thinking this wreaks of a loss. Their stadium will be half full, they’re kind of like the last two teams who both beat us at home, and this bunch of Hokies have got to be getting tired. I know I am and I haven’t played a down in…ever. I hope you’re right! But if you bolstered my hopes just for us to take a trip to the woodshed, I’ll…think mean thoughts!